Working just north of Flushing, Ohio -- near New Athens, Ohio -- for the last forty years, the Silver Spade has been one of the largest earth-moving machines in the world. 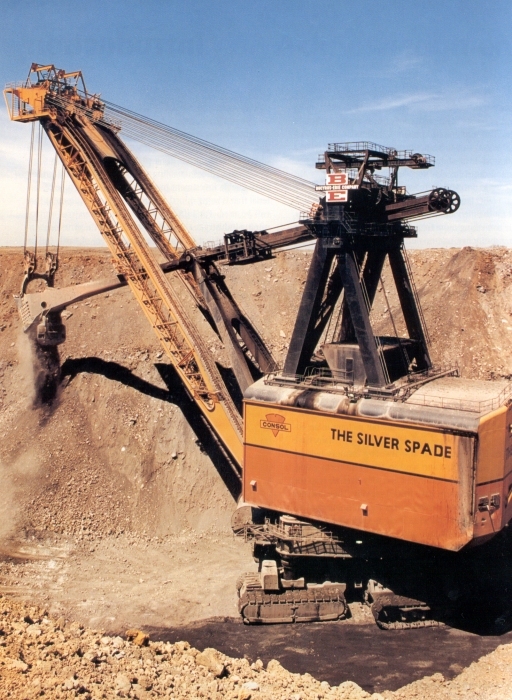 Featured on the television program and videotape/DVD, "Monster Machines", the boom of the Silver Spade can be seen from various locations in and near Flushing and New Athens. The Silver Spade constantly is on the move, so it is not possible here to state exactly where it will be when you seek it, but you will see its handiwork from every road. With some exploration -- or a stop in New Athens or Flushing to ask where it currently is working -- you should be able to identify its current location. Caption: Silver Spade. For a larger version, click image. Consult the Museum's website for details on the Ohio Coal & Surface Mining Museum Project.